From small beginnings as an importer of early fireworks, to an international contender in the pyrotechnics field, Howard & Sons have travelled far, bringing fire, vibrant colour, heart-stopping effects and choreographed light to night-time skies all over the globe. Four generations of pyrotechnic skills has made Howard & Sons Australia’s leading fireworks company. Sydney-based, but with representatives all over Australia, pyrotechnics design and manufacturing departments within our forward-thinking environment have produced in-house, custom materials used in complex cityscape displays, all of which have been highly acclaimed. Howard & Sons Pyrotechnics have followed in the tracks of entertainers as they venture out on international tours, providing reliable, safe, awe-inspiring outdoor or indoor pyrotechnics night after night after night. Howard & Sons Pyrotechnics have created Great Spectaculars from scratch for events seen on televisions, phones, tablets and computer screens all over the world, designing custom fireworks, equipment, and choreography to delight every audience. Howard and Sons Pyrotechnics have hosted pyrotechnic events for some of the biggest international sporting occasions, for New Year celebrations in major cities, and for national and international holidays and anniversaries all over the globe. Howard and Sons Pyrotechnics have been awarded numerous Gold and Silver medals for renowned, international fireworks competitions hosted in various locations such as Canada, China, Malaysia, Sweden, Monte Carlo, Spain, Korea, Oman, Vietnam and Monaco. Don’t just take our word for it. Have a look at the gallery to view our work or browse YouTube. From iconic pictures of our New Year celebrations display in Melbourne, to the 50th Golden Jubilee of the Kingdom of Brunei, Howard & Sons Pyrotechnics, Australia, always delivers a world-class performance. International events need professional guidance. 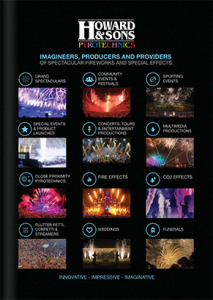 With experience in all manner of logistics challenges, Howard & Sons Pyrotechnics will transport uniquely designed and choreographed festivals of sound and vision right to your doorstep, no matter how far.